Having a healthy plant in your tank will help to improve the water quality by filtering out waste and removing some of the CO2 that’s produced by your fish and decomposing food left in the tank. This could also reduce the frequency of water changes or at least the volume of water required to be replaced at each changing. Not only will plants help to clean the water, they’ll also give your fish somewhere to play, rest and hide, which will help them to relax more, be less stressed and in many cases become more active. Much like plants found in your garden or at the local park, Aquatic Plants need a little TLC to thrive. From lighting to fertilizer or even to the substrate (soil or gravel) itself, a plant’s environment will effect its health, growth and appearance. The amount of TLC required will depend on your tank setup, the ratio of plants to fish you have, or just the amount of plants you have in total. How much work do you want to put into maintaining the plants. The climate you live in. Does the temperature fluctuate from day to night or is it stable? The positioning of the tank for sun exposure, some plants like low light others need as much lighting as possible. Why do you want to have plants in your tank? Is it for aesthetics to be enjoyed or more for your fish’s benefit. By considering these things then you’ll have a better idea of the scope of the setup you require. If you are using driftwood in your aquarium then you should also read our article on the Aquarium Wood. Whether you live a busy lifestyle, are new to Aquatic Plants or are on a tight budget. There are low cost options that require little to no additional time commitment. Just by performing the basic care for your fish would be enough to sustain your new plants. A small blue red LED light would be enough to provide a small number of plants ample lighting. If you stick to the golden ratio of 1-2 small plants for every fish, there would be enough waste being produced by your fish to feed the plants. 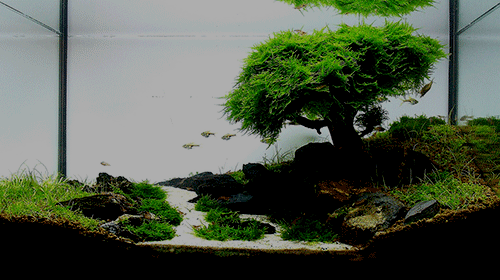 By using floating plants such as Hornwort, or plants such as Java Fern that can be anchored to driftwood, tank decorations or rocks. Removes the need to have a substrate at the base of the tank. 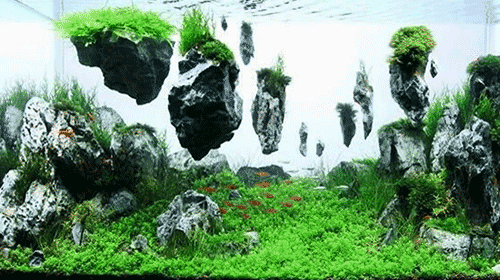 A similar thing could be achieved by using Moss Balls. Just remember to check with your stockist for the level of lighting required for the plants you’ve chosen and whether or not they’ll require additional fertilizer. With the correct setup you can turn your little friends home into a lushes forest of Aquatic Plants. The more plants you add how ever can result in the water being depleted of ammonia, nitrates and CO2. This is easily rectified with the use of fertilizers and CO2 liquid. Or if you have less time then money, a complete self sustaining system can be incorporated into your tank setup reducing the amount of labor required for maintaining the picturesque forest. Timer switch – Ideal for ensuring that both the lighting and CO2 flow is controlled effectively, removing the need to manually turn them on and off. CO2 Bottle or Cylinder – The larger the bottle the more cost effective. Regulator and attachment – used to reduce the pressure flow of CO2 and control how much is being discharged. Use correct attachment to suit your choice of CO2 unit. Solenoid – To prevent wastage this is used to turn off the flow of CO2 when the plants aren’t feeding, when there is no light. Diffuser and Tubing – CO2 is fead into the tank via the tubes, being dispersed through the Diffuser as mist bubbles. Bubble Counter – Allows you to monitor the flow rate of CO2 entering your tank via Tubing. Blue – Low levels, safe for fish but not enough to feed your plants. 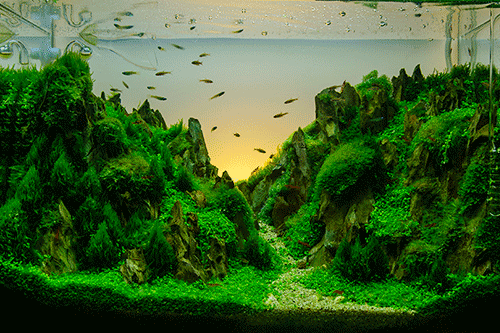 Green – The ideal balance for both fish and plant. Yellow – High levels, fine for your plants but dangerous for your fish. Lighting – Lights commonly comes as 2 main types, LED and Fluorescent. Plants will need at least a minimum of 8-12 hours of light either natural or artificial. The higher the light levels the more CO2 anD fertilizer would be required. Many units are capable of switching to a different lighting spectrum with the push of a button. They give off little heat and are unlikely to over heat your tank. If one globe is blown the whole unit may also stop working. Some models have gotten around this problem but once a globe is blown there’s no way to replace it so the whole unit would need to be replaced instead. They can come in a large variety of shapes and sizes. If changing to a new tank, you may need to find a new lighting unit as the new tank may be of a different size. Each tube can be replaced out once blown or broken. They give off heat so can be used to heat up your tank, if the light is too big for your tank you run the risk of over heating the water. Different tubes can be used for the different lighting spectrum. If a tube is well used it may become weaker and unable to emit its full spectrum and would need to be replaced even if its still emitting light. Sizing tends to be universal with lengths and widths of a tube changing at set increments. This makes planing a fit-out easy but limits true customizing to set sizes. Pump and Filter – Typically when having a large amount of plants in your tank you want to avoid breaking the surface water to help keep the CO2 levels in check. If there are more plants and a few fish such as 1 or 2 Betta (male and female) it can be considered a low Bio-Load and as such a filter can be forgone for the use of a current pump simply to move the water around the tank. If there are a high population of other aquatic life such as snails then it can be considered a high Bio-Load and a filter would be needed to help keep the tank clean. The biggest draw back to this is that it can also remove the nutrients needed for the plants, so slow release fertilizer blocks maybe be need to offset the balance. Substrate – A basic single Substrate can be found here. A thick layer of Substrate would be ideal. Not only would it provide a more realistic look, it can also double up as a slow release fertilizer breaking down organic matter buried within its layers and offers a surface for the plants to take root. The ideal substrate would consist of 3 varying sized grit layered with the larger size first through to a thicker “top soil” layer of finer grit. The overall thickness should be 1.5” to 2” thick. This will allow your plants to develop a strong root system with the varying sizes in the substrate acting as filler as well as helping to filter out organic material. Depending on you needs of both your fish and your plants, as many as 6-9 different grades of grit or compounds can be used to build up your substrate. Whether looking to make a realistic looking forest, a flowing riverbed, or even an artistic representation of a meadow. A little planning and dedication can yield some marvelous results. You may be tempted to put the taller plants towards the back and smaller ones at the foreground. Try to avoid doing this too much as having some smaller plants in the background and some bigger ones at the front can add to depth of view. Where it is practical, use the substrate to create hills and gullies this can also give the illusion of space with a rising hills towards the back can aid to making the smaller plants look larger in the distance. By using moss you can make a clump look like a field of grass being cut by a path. A similar illusion can be performed with driftwood and some wire. If stood up right with its “branches” out stretched and the moss growing over the branches so the moss forms a leaf like covering to mimic a tree. Using larger full light plants or floating surface plants to filter the light will also allow for you have smaller low-moderate light plants as well. As long as some light gets through for the smaller plants, different plants can be kept together. Just remember to have an area out of the light for your fish to retreat to if they were to feel the need to get some shade. Consider similar shaped species of various sizes and colors. Do not be afraid of using reds, browns, and exposed rocks to add color to your pallet. Keeping in mind what you are aiming to achieve. Look into the available options regarding plant species and equipment required to perform your desired outcome. No, you should not leave the light on in the Beta’s tank as they do need a well cycled sleep. It is best even to turn off the lights in the room your Beta is in so it may get the proper amount of sleep. I find it best to turn off the tank light when I go to bed and turn it on when I wake up since I’m on a regular sleeping schedule. I have two female beta fishes in a tank.One of them appears to be shedding its skin and now a skin coloured patch is visible near its abdomen and seems to be increasing.It does not mtch with any of the illnesses symptoms.She also does no seem to have an appetite.Really concerned.Pls help. It may not be an illness. Female Betta Fish can be just as territorial as the males. The female losing its scales could be getting attacked by the other female. It would be advisable to keep them in separate tanks from one another. Or look at getting an larger tank. There’s a section that goes over keeping multiple females in the one tank. It might help to work out how to keep your fish together.